"Encryption: No one else can read your instant messages." "Authentication: You are assured the correspondent is who you think it is." "Deniability: The messages you send do not have digital signatures that are checkable by a third party. Anyone can forge messages after a conversation to make them look like they came from you. However, during a conversation, your correspondent is assured the messages he sees are authentic and unmodified." "Perfect forward secrecy: If you lose control of your private keys, no previous conversation is compromised." Open the preferences, accessible via the Adium menu in the menu bar, and select the Encryption pane. Click the Generate button. This fingerprint is unique for the account selected in the dropdown. Make sure you have the "Encryption" (lock) item in the chat window's toolbar. If not, click "Customise Toolbar..." from the View menu and add it. Open a chat with the contact with whom you want to have a private conversation. Notice the "Encryption" item in the toolbar appears unlocked. It signifies the chat currently is not encrypted. 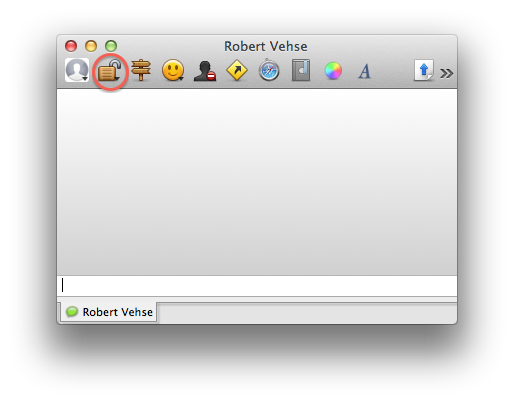 Click the icon and select "Initiate Encrypted OTR Chat". Notice the previously unlocked icon is now locked. You will be prompted to verify the fingerprint of your contact. If you are certain of its trustworthy origin click "Accept". Next time you start an OTR chat with the same contact, Adium will remember you verified their fingerprint so you will not have to do so again. There are four different settings which can be adjusted on a per-account and on a per-contact basis: "Disable chat encryption", "Encrypt chats as requested", "Encrypt chats automatically" and "Force encryption and refuse plaintext". Open preferences, select the Accounts pane and double-click the account. Click the "Privacy" tab and choose your option for this account from the dropdown. In the chat window/tab you have open with the contact in question, click the lock in the toolbar and choose your option via "Encryption Settings". By default, Adium stores all of your chats locally. You might want to disable logging of chats on your computer entirely or just for OTR-encrypted chats or specific accounts. Open preferences, select the General pane.